Awards.BG presents for the first time to the Bulgarian audience the national contests BEST DISCO & NIGHT CLUB OF THE YEAR BULGARIATM and BEST DJ OF THE YEAR BULGARIATM . These will be the night life awards which would identify the most talented Bulgarian DJs and the most famous night and disco clubs in Bulgaria. The vote is given directly in the hands of the clubbing audience from all over the country. The contest BEST DJ OF THE YEAR BULGARIATM aim is to support the Bulgarian music authors, artists and DJs, nominate and award the best among them and give them the opportunity to work in the best clubs. 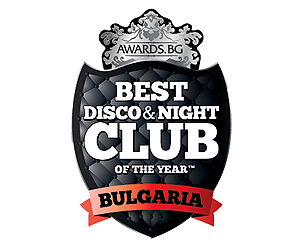 The contest BEST DISCO & NIGHT CLUB OF THE YEAR BULGARIATM will promote the best Disco & Night Clubs in Bulgaria. Each of the contests consists of direct nomination and vote given by the internet users. This way an independent and objective vote can be performed eliminating the influence of a prejudiced jury which selects the winner. Additionally, an automated computer nomination and vote counting will eliminate any other human interference. The voting is restricted by and IP address and every IP address can register one vote only. Everyone can vote by sending a text message, but not more than one per SIM card. In this stage, the internet users can suggest several Bulgarian DJs, night or disco Bulgarian clubs and nominate their favorites in the different subcategories on the awards.bg web site. The contests in 2010 will start their first stages in the middle of June on 20.06.2010 and will continue until 19.09.2010. In this stage the final voting and selection of winner in each of the subcategories is held. In each of the subcategories in both contests there will be five participants, who collected most nominations in stage 1. The duration of stage two is from 20.09.2010 until 18.10.2010. Gala awards ceremony to the winners in both categories in the contest will be held on 28.10.2010. At the ceremony will be present the best and most beloved Bulgarian DJs, promoters, managers and owners of the most popular and elite Bulgarian clubs, different brands and products representatives, consistently supporting the premium segment in the discotheque business. The awards ceremony will give the opportunity to the winners in both categories Best DJ and Best DJane to perform their warm up sets before the guest star of the event. Depending on the technical and financial possibilities, another option is to have the awarded DJs in the different categories playing back-to-back in a second room in which there will be parallel party. The scenario of the awards ceremony will also include performances of various of artists. BEST DISCO & NIGHT CLUB OF THE YEAR BULGARIATM & BEST DJ OF THE YEAR BULGARIATM are trademarks.